Looking for a fun way to end your school year? Ross Farm Museum is only a call away. Leave the classroom and step back in time experience the culture and appreciate the heritage of living on a rural, upland farm in the mid-1800's. Ross Farm Museum is a living, working farm located on Highway #12 in New Ross, just an hour drive west of Halifax. Nestled in 60 acres of drumlin farmland it provides plenty of outdoor fun and adventure. This educational tour is offered with school groups viewing Rose Bank Cottage, the Farm Workshop, Edward Ross Store, Cooperage, Ross Barn Stable (where animals are housed) & exhibit area, Blacksmith Shop, Larder Barn(exhibit area) & a School. 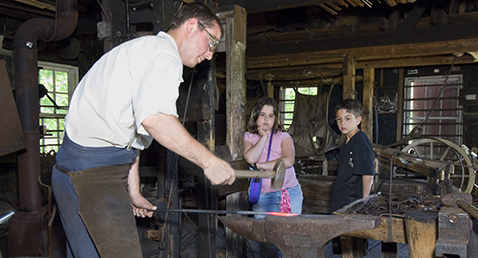 There are demonstrations that the students can watch such as the cooper making barrels, wool spinning in Rose Bank Cottage, blacksmithing, and woodworking to name a few. There are historic breeds of animals including the Canadian horses, Oxen, Cotswold & Southdown sheep, Berkshire pigs and rare poultry breeds including Dorking & Hamburg. Students leave the site with a much better understanding of life 150 years ago. 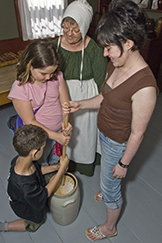 These tours are suitable for all grades and are a great way to have fun while learning about our past.